Strong demand for a limited supply of homes for sale has continued to rise despite higher interest rate increases, at least for now. If mortgage rates rise further that could put a damper on the party, although that has not happened yet. Demand could weaken slightly. Buyers should be prepared with competitive offers and getting pre approved for a mortgage will help execute a contract faster! 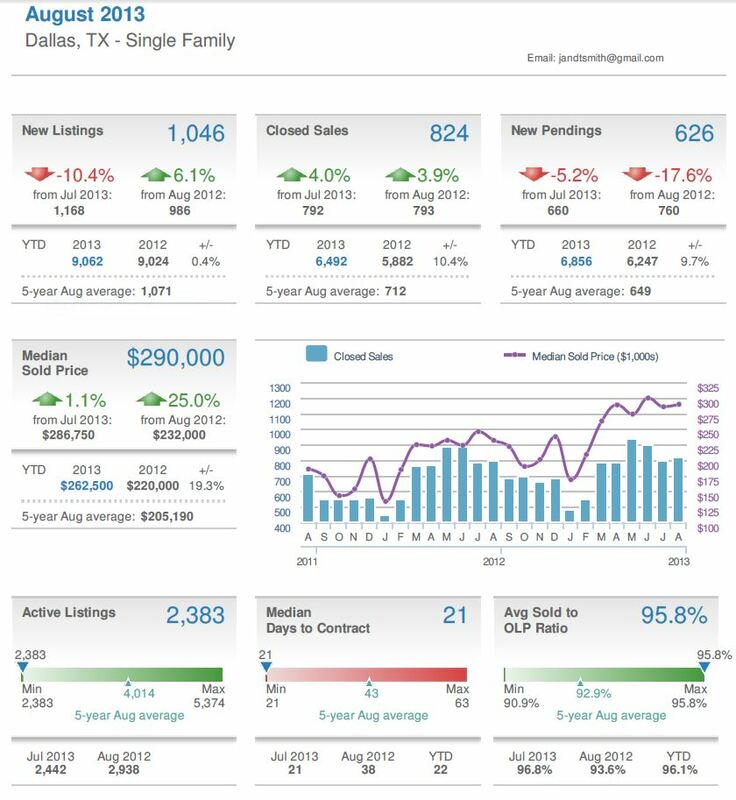 New Listings in the Dallas area increased 6.2 percent to 986 from Aug 2012. Pending Sales were down 17.6 percent to 760 from Aug 2012. Inventory levels shrank 23.2 percent to 2383 units from Aug 2012. Prices got a big boost! The Median Sales Price increased 25 percent to $290,000. Median Days Market was down 21 days vs 38 days from a year ago. Average sold price to list price was up 95.8% vs 93.6% from Aug. 2012. Federal Reserve has now held off on future rate increases but you never know how long that will last. Labor market growth is positive but still extremely soft. Things like gas prices, stock market changes and world economics have a way of slowing the consumer down or at least take a break. At the moment, Dallas real estate is a bright spot. The chart above is an easy way to look at market data quickly. Interesting are the 5 year averages, it tells you how far we have come since the meltdown. Information is provided by the Dallas MLS and CoreLogic. You can click the link below if you’d like to see a larger version.